Metabolic syndrome is the name for a group of risk factors that raises one's risk for heart disease, stroke, and diabetes. According to the National Heart, Lung, and Blood Institute, the term "metabolic" refers to the biochemical processes involved in the body's normal functioning. Risk factors can be defined as traits, conditions, or habits that increase one's chance of developing a disease. Five conditions are defined as metabolic risk factors: high fasting blood sugar, high blood pressure, low HDL cholesterol level, high level of triglycerides, and a large waistline. Having at least three of these conditions leads to a diagnosis of metabolic syndrome. The good news is that action can be taken before conditions get out of hand. There are healing herbs that help fight against the risk factors before they begin or become worse. Tomato is believed to be the second most popular "vegetable" in the world after the potato, but most are unaware that it is really a fruit that boasts health benefits. Tomatoes are high in vitamins A, C (ascorbic acid), and E, as well as other important nutrients like potassium, phosphorus, manganese, and magnesium. Its primary active compound is lycopene, which is found mostly in the skin of the fruit, and has strong antioxidant properties. These compounds have been linked to cardioprotective effects, including the reduction of cholesterol levels and blood pressure, which in turn leads to a decreased risk of stroke. Try a tasty, yet simple topping of basil tomatoes and start reaping the benefits of this versatile herb. Traditionally, guava leaves have been used to help treat gastrointestinal disorders like diarrhea, as well as fever, cough, mouth sores, and wounds. While the guava fruit is widely consumed and it is rich in vitamins and nutrients - mainly vitamin C (ascorbic acid), other antioxidants, and fiber - the guava leaves exhibit great medicinal properties. They contain a unique phytonutrient called guava leaf polyphenol, which is thought to be the main compound behind the plant's hypoglycemic properties. It works by inhibiting some alpha-glucosidase enzymes, thereby controlling blood sugar levels. Guava leaf has also been shown to reduce LDL cholesterol levels, though the mechanism is not well-defined. Guava juice is a popular form of consuming this delicious fruit to gain all its benefits; however, be aware that commercial, canned guava juice may contain a fair amount of sugar as well as artificial color. Go for natural, sugar-free options. On the nutritional side, papaya has shown to be a great source of vitamins B9 (folic acid) and E; minerals, such as calcium, magnesium, and potassium; and dietary fiber. Papaya is also an excellent source of antioxidants, such as beta-carotene - a precursor of vitamin A (retinol) - and vitamin C (ascorbic acid), which prevents the cellular damage caused by free radicals and promotes cardiovascular health. It also helps lower cholesterol levels due to its high dietary fiber content. 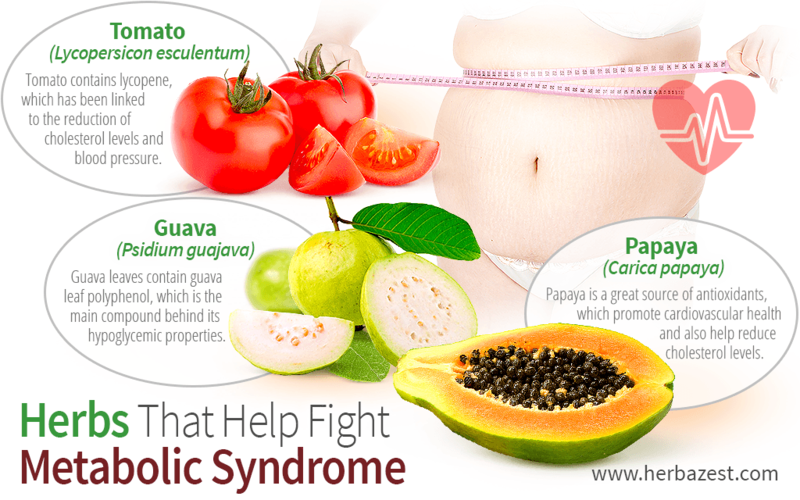 There are many ways to incorporate papaya into your daily diet: fresh and diced, in juices, or as a delicious avocado and papaya salad. Consuming these tasty foods on daily basis can contribute to improving your diet and keep away metabolic syndrome. Take action today for a healthier tomorrow! National Heart, Lung, and Blood Institute, What is Metabolic Syndrome? Purdue University, Papaya: Carica papaya L.